SharperTek® Automated Industrial Strength Heated Ultrasonic Cleaning Machine with Tube Flushing Capability. 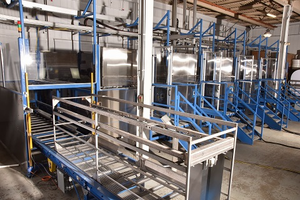 Multi-tank unit consists of a total of 5 tanks: ultrasonic cleaning tank, ultrasonic wash/rinsing tank, ultrasonic rinsing tank, a super-heated rinse tank, and a drying tank. Heated Nitrogen purge during dry cycle- Dries the I.D. All tanks are mounted into a stainless steel table-top assembly which is mounted to a steel frame assembly, size 650” x 140” x 150” tall. The frame is enclosed with stainless steel panels which allow for access to all internally mounted components. All components are mounted in this frame assembly. NEMA4X control enclosure includes Master Power Button with indicator light, E-stop, Manual Ultrasonic and dryer tank controls with digital temperature controller, ultrasonic generator indicator lights, control box safety access switch, and options controls. Tubes/parts are connected to parts basket at load conveyor. Operator pushes start cycle. Conveyor moves basket to gantry pick-up position. Gantry picks up basket places in to washing tank. Wash tank cover automatically closes. Ultrasonics turn on and flushing of the interior of the tubes begins. Flushing pulsates during cleaning cycle. Cleaning cycle finishes and gantry indexes to next tank. When the gantry drops the basket into the drying tank the high volume blower turns and as does the heated nitrogen purge. With the dry cycle complete the gantry removes the basket from the last tank and drops it onto the unload conveyor. Unload conveyor moves basket to unload location. Tubes/parts are removed from basket. Operator presses unload operation complete and the conveyor cycles the basket into pick-up location. The gantry return the basket to the beginning of the line.